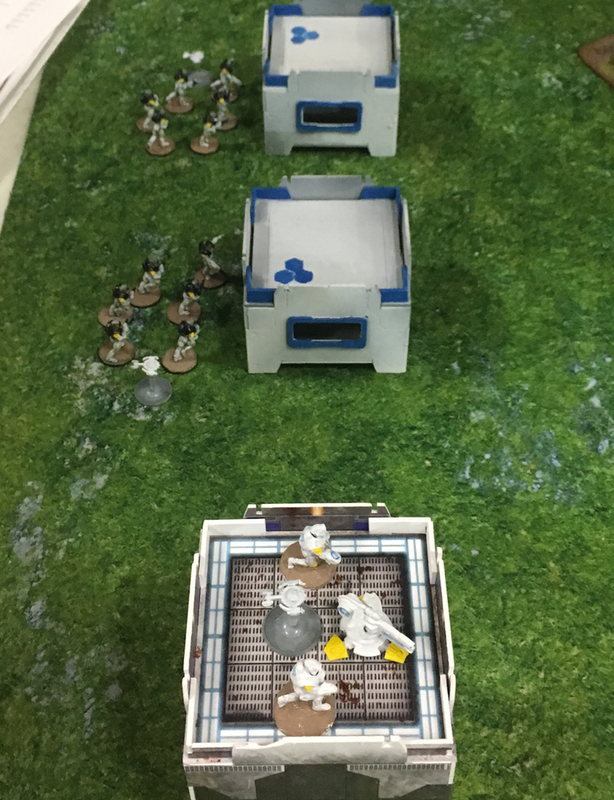 Today was the first day out with the core of my Isorian army for Beyond the Gates of Antares. Local Concord enthusiast Jeremy was out to give my 750 points of Isorians a good test. Aside from the Tsan Ra Torus squad the army was quite similar to the Concord force opposing it. Two Phase Squads, a Command Squad, a Support team with X Launcher and a Drone with a PLS. Jermey had a similar force except that he replaced the Drone with a Plasma Cannon support team and the Tsan Ra with a third C3 team. 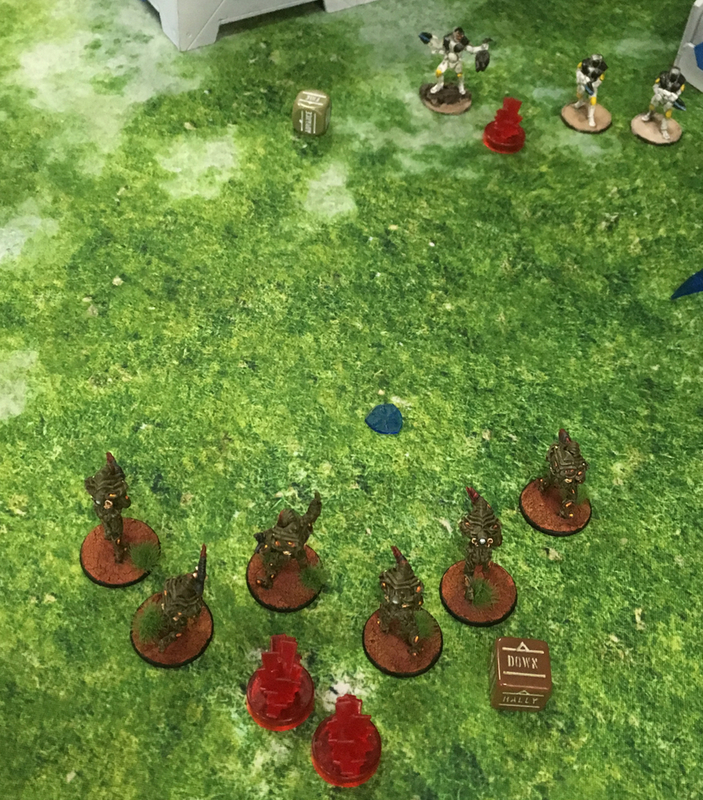 We decided to play scenario 4, Hold the Line, and Jermey chose the option of being the defender. 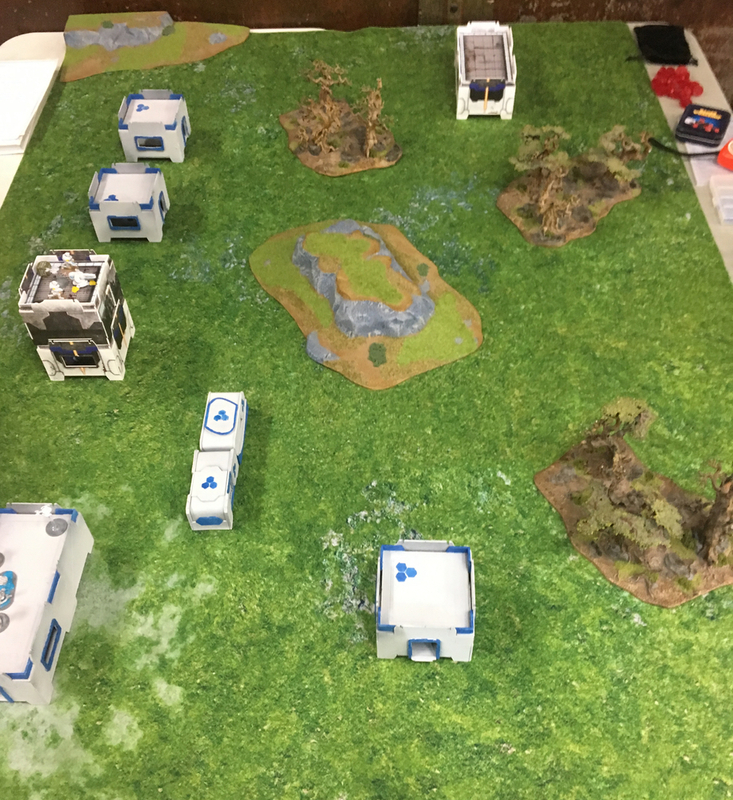 We moved some of the terrain around so that most of the area terrain was on my edge and Jeremy had more buildings to defend as objectives. He put his Plasma Cannon and X launcher teams in buildings and on Ambush and also put his Command Team hidden behind the X Launcher team. 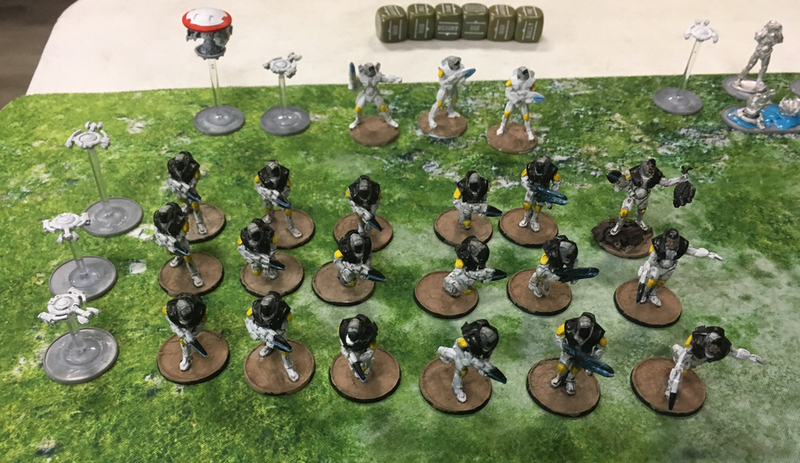 I have been playing Ghar Rebels since I first got into Antares and so 750 points of Isorians was fewer activations than I was used to as well as fewer models. Those Black Guard units are cheap and have a lot of little grunts in them. Also, I was able to use drones! I have been waiting for this day! I put a Batter drone with my PLS Drone and also added a Medi Drone to the Command Team. Everyone but the Tsan Ra and Command squads also had Spotter drones. Being able to reroll is a boon most people don’t think of until they either lose the Spotter or just never have then to begin with. The first turn went quickly and there was almost no fire. 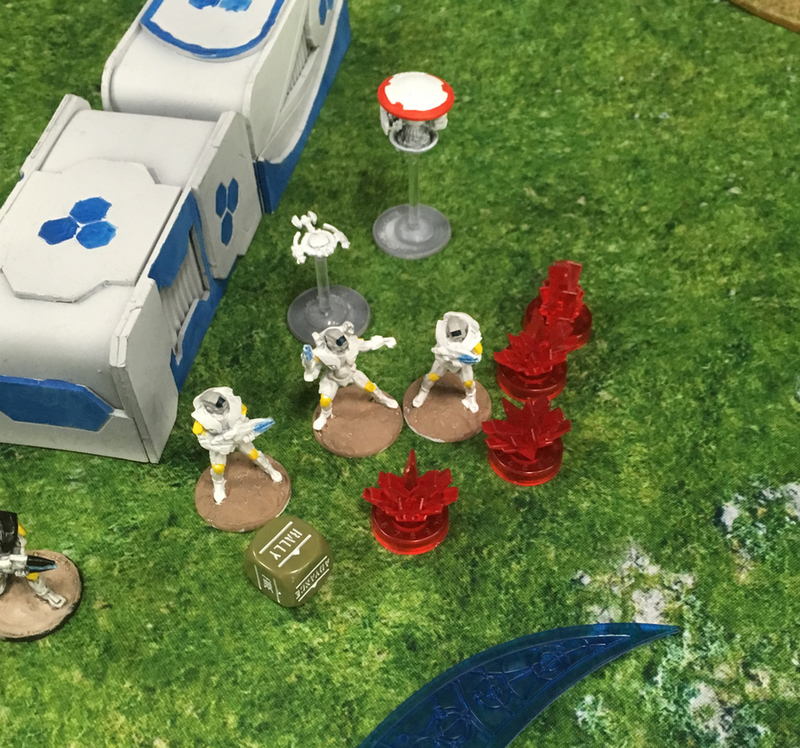 Jeremy tried a shot with his Plasma Cannon but the Batter field skewed the shot wide. The X Launcher team also tried a shot but it didn’t hit and scattered wide. 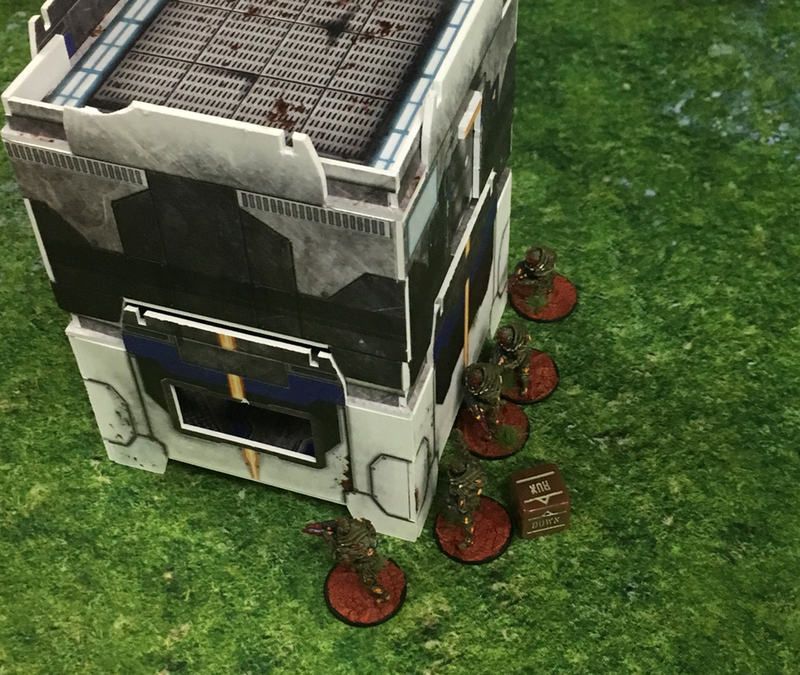 My plan was to send a Phase Squad and a Tsan Ra squad at each objective building. The PLS Drone and the X Launcher would try to pin down Jeremy’s support team and also try to soften up the opposition for assaults. 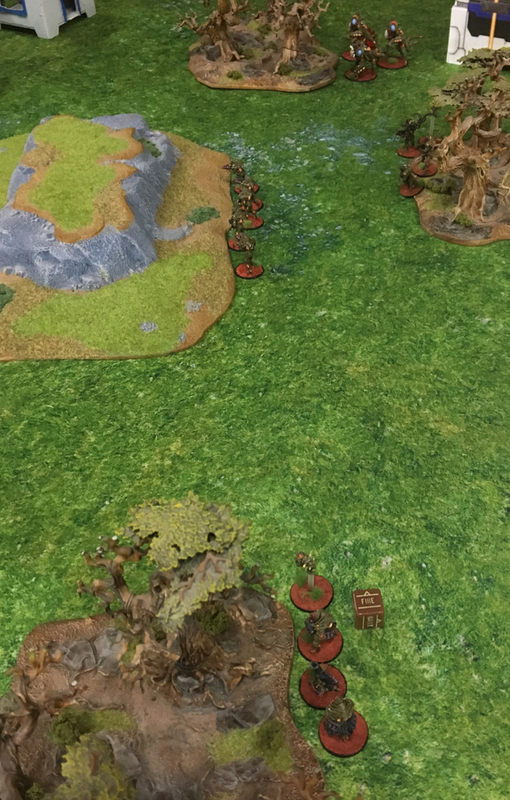 At 750 points I didn’t have a lot of troops to spread around to each objective but I thought that the Tsan Ra would draw some fire and let my other teams advance. This plan was thrown into a shambles by my inability to pass Command Tests. 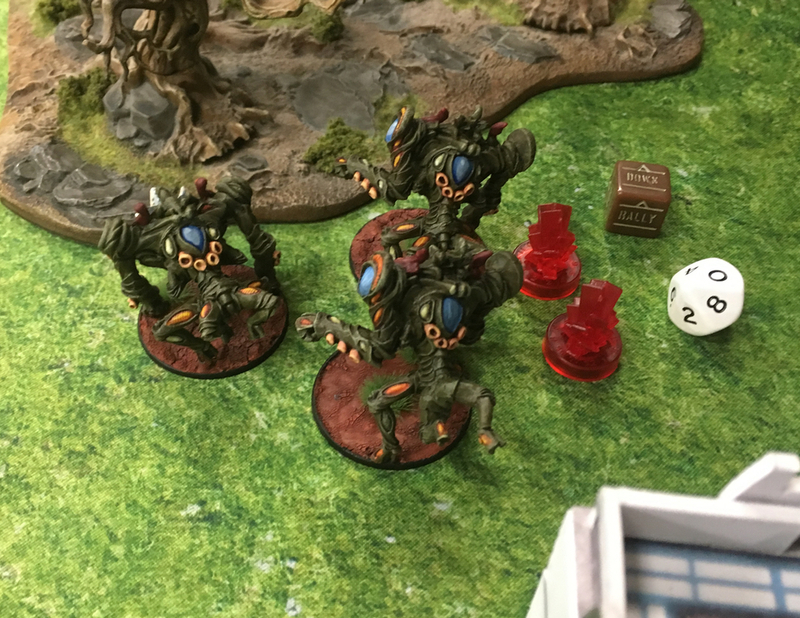 My Tsan Ra sprinted on turn 2 and gained a Pin Marker. They then failed the next Command Test to run into the woods. They failed the roll to return the Down Marker. They then failed that again. They finally cleared the pins and then ran into the woods. Next turn they failed an Agility test and were unable to move. 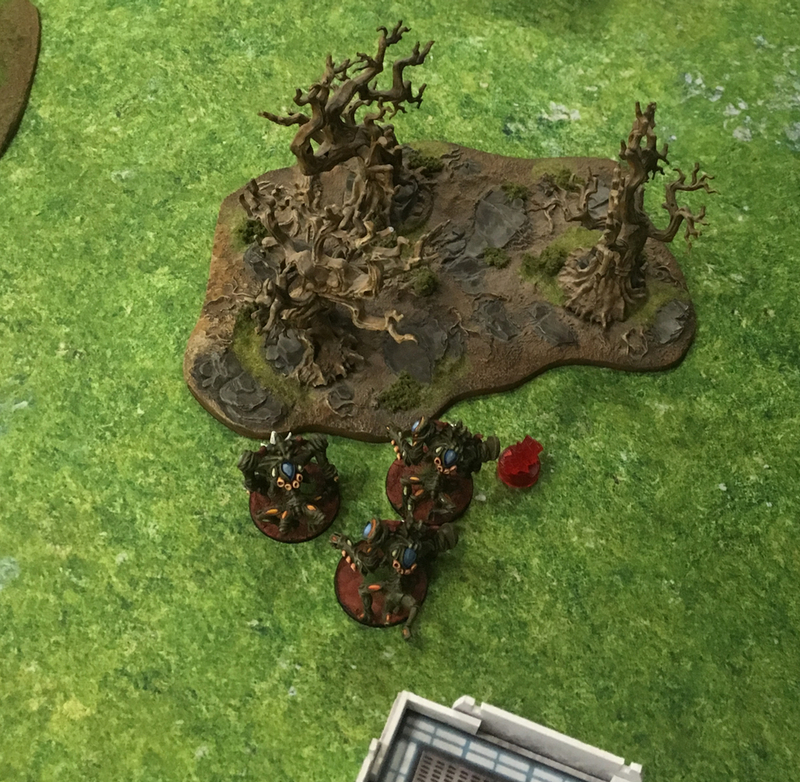 Instead of drawing fire as they rushed to assault an objective they were stuck behind a woods for most of the game. 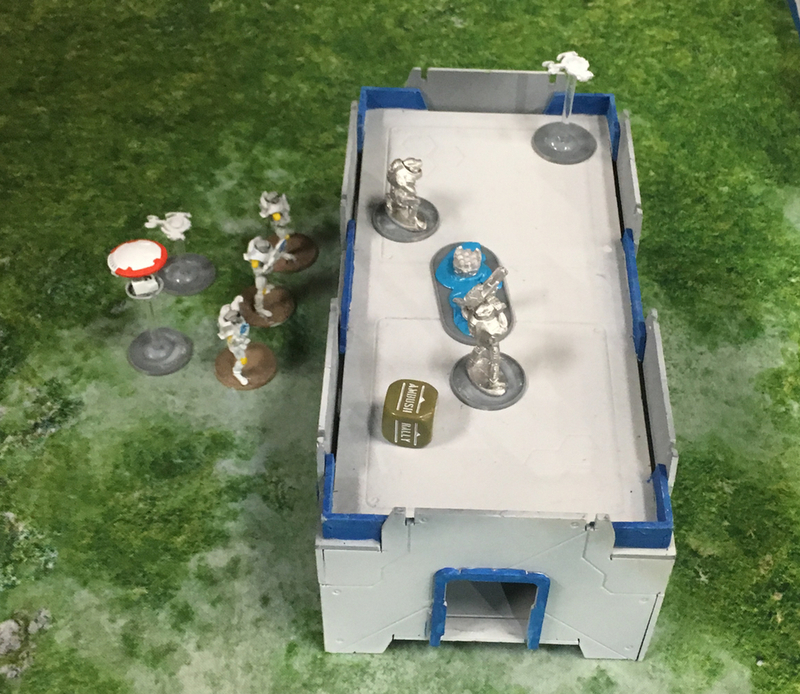 This left Jeremy free to pour fire into the Phase Squad attacking his middle objective. 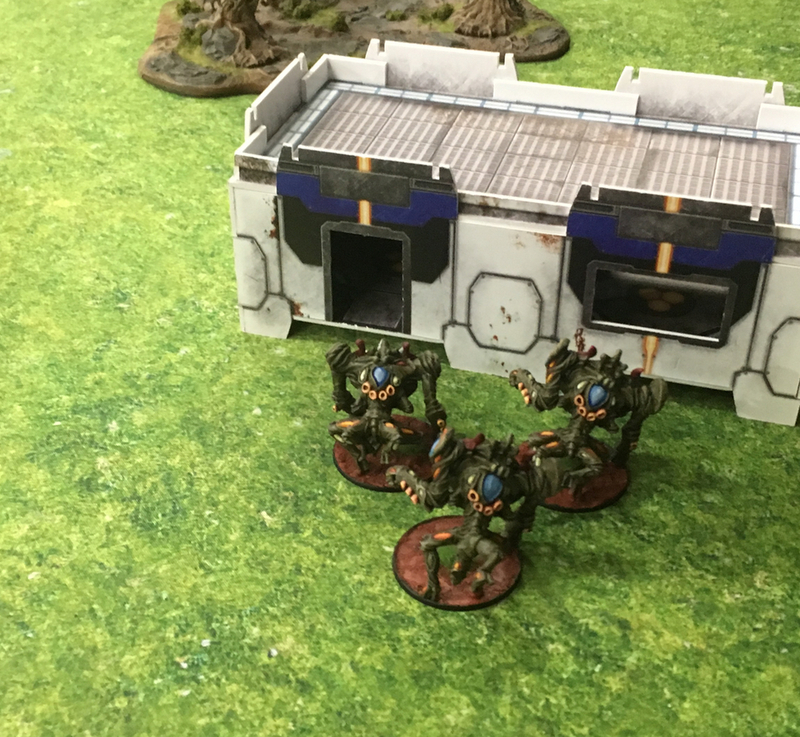 I happily used their Phaseshift Armour to put them Down which saved a lot of them. 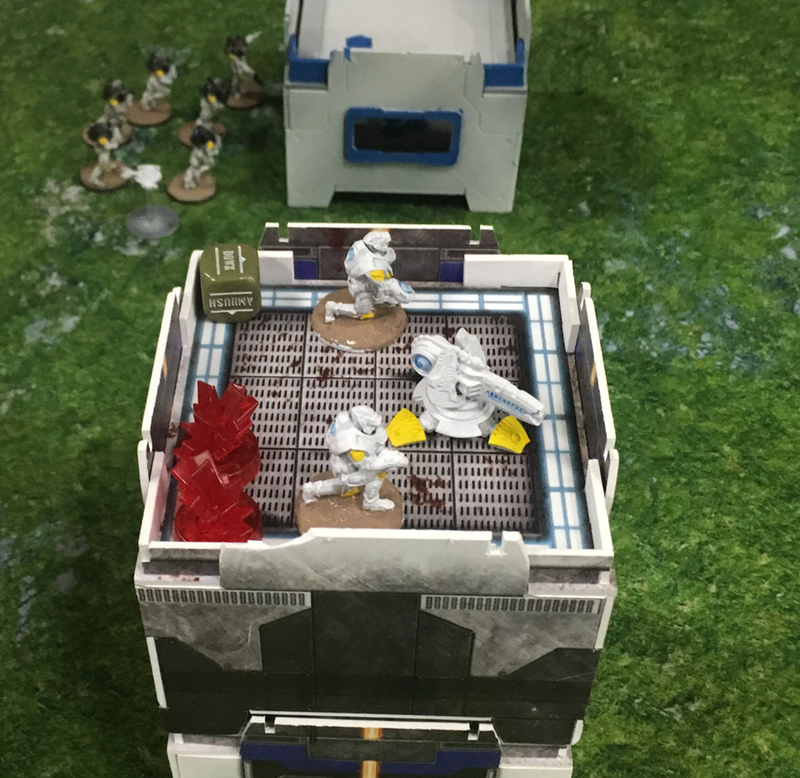 Oddly despite the damage they took they were the only squad to make it to an objective. My X Launcher team was happily dropping ammo across the table. The Concord X Launcher and Command team got clipped with a Scramble munition and then the Plasma Cannon got his with a Scoot round. 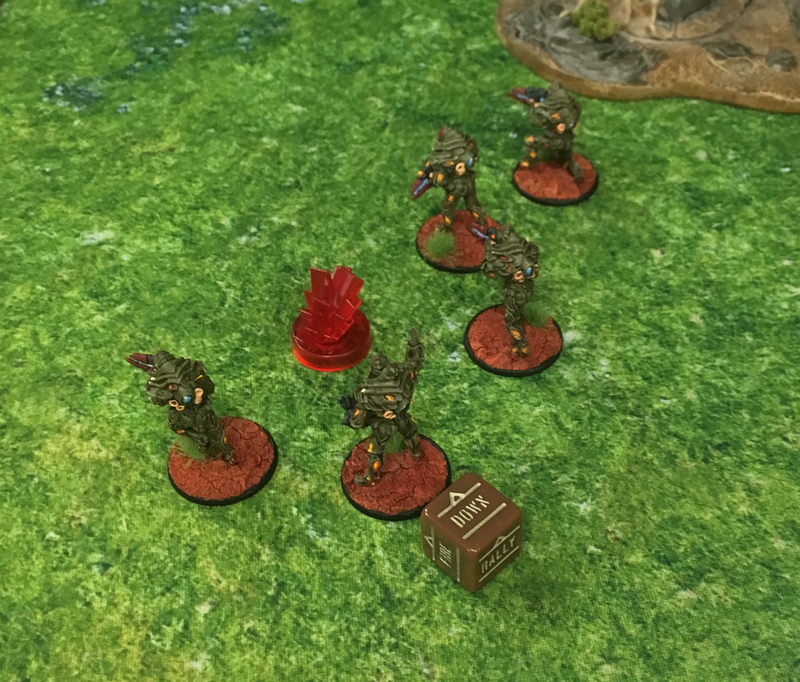 Sadly it was already Down after failing a Command check but the threat was there. 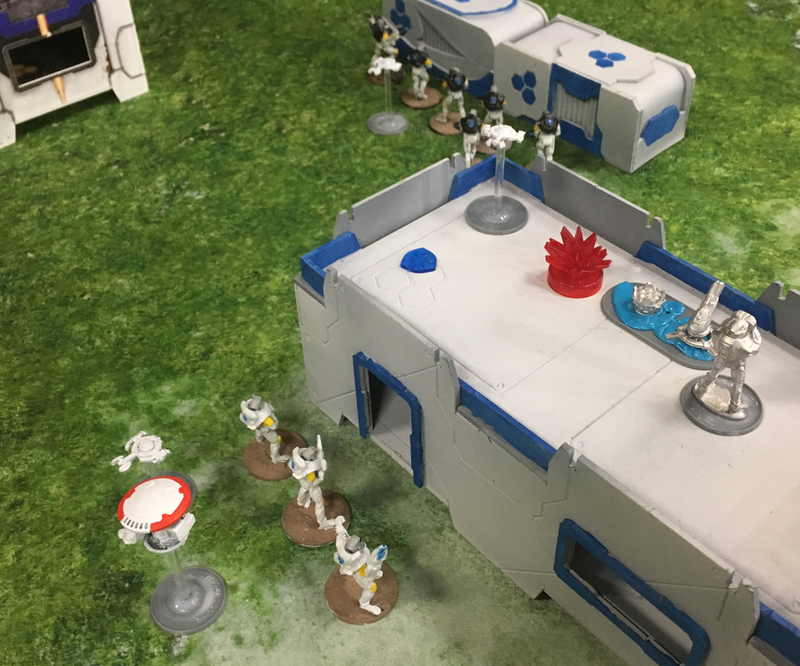 My most successful attack was on the left flank where the PLS Drone and a Phase Squad attacked the objective held by the X Launcher. 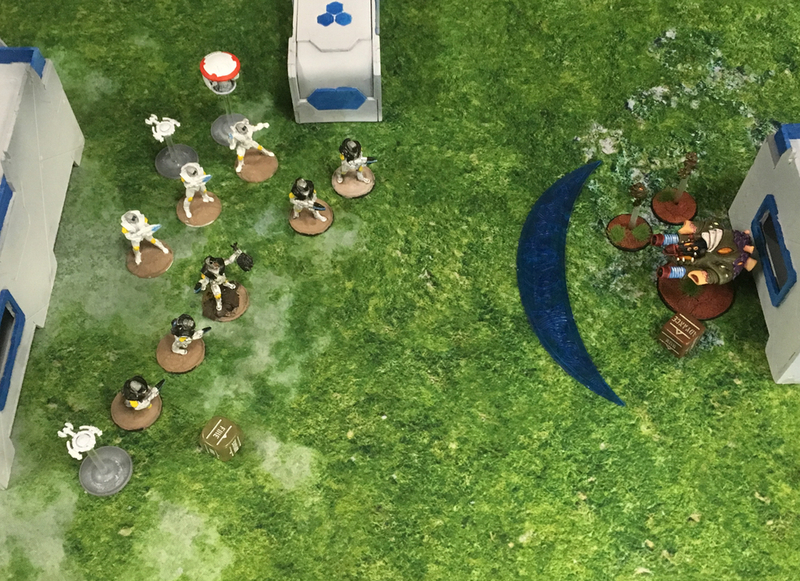 I had a nice firebase created using the Batter drone to protect both squads but Jeremy dropped a Scramble round right in the midst of both units which dropped the Batter field and forced the PLS Drone to move and then fire. 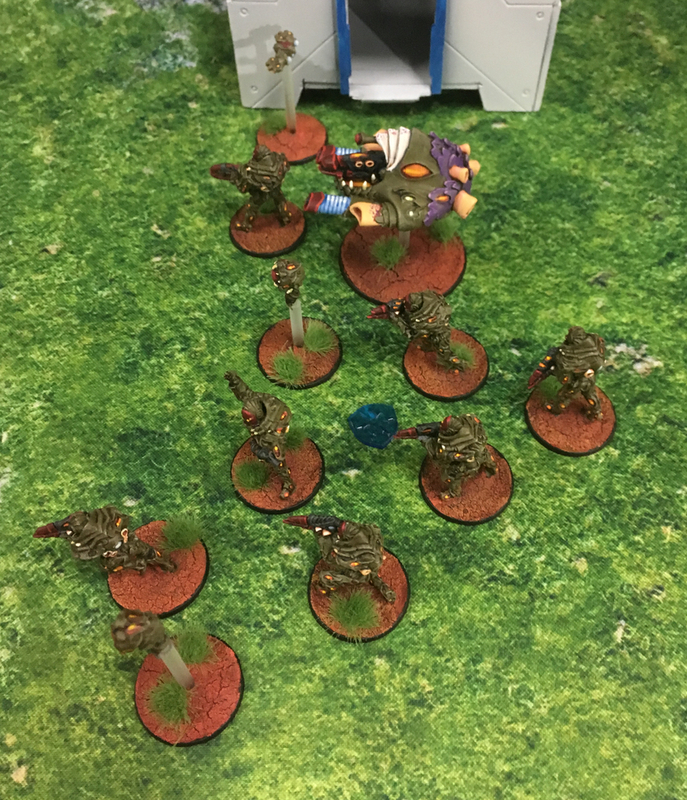 In the middle of the table the Plasma Cannon team took a pile of fire from my Phase Squad (5 hits) and Jeremy passed all of his Res tests except the one for the Plasma Cannon. Ooops. 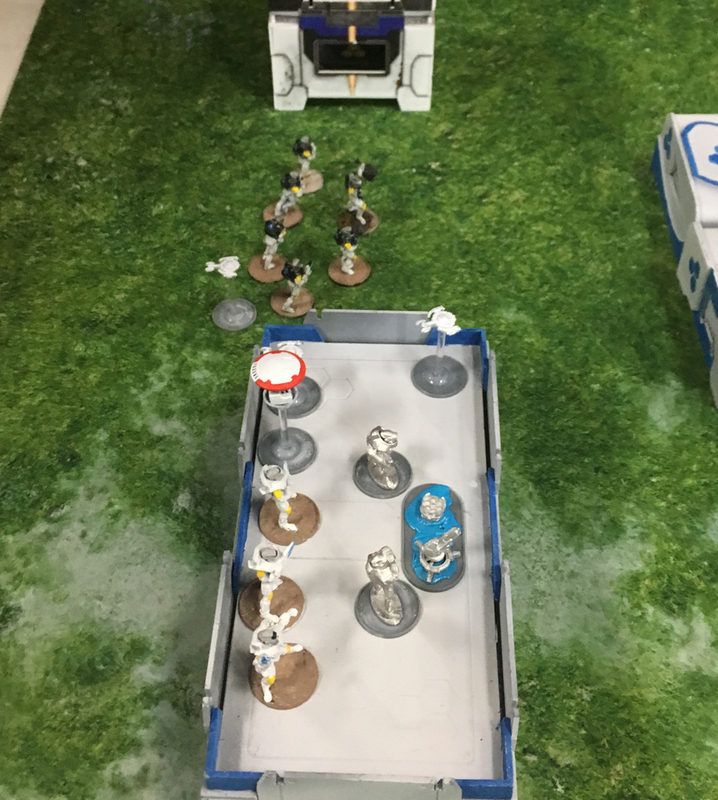 In the next turn I managed to remove the rest of the team so that objective was clear to take. 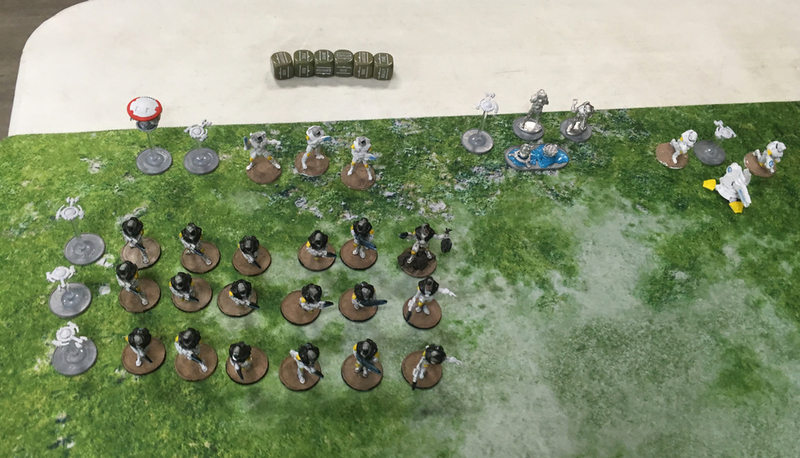 Jeremy brought over this third C3 Squad which he had been holding in reserve and then used it and his Command Squad to try to stop my advance. The X Launcher team broke which meant that if I could assault his C3 team and win I would probably win. 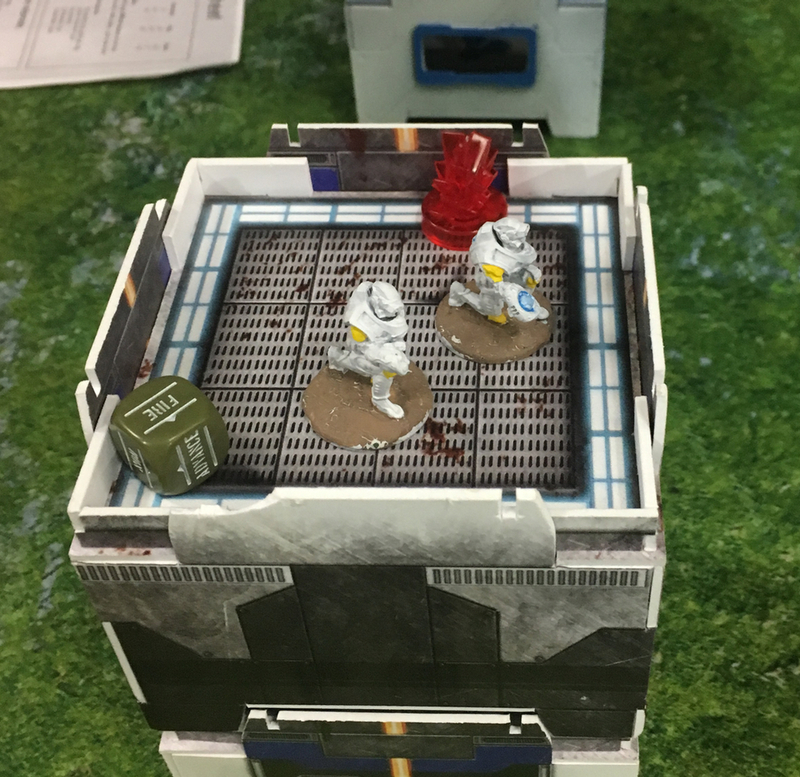 As luck would have it the Phase Squad had a single Pin Marker on it and I failed the Command Test to assault. Jeremy managed to Hold the Line. 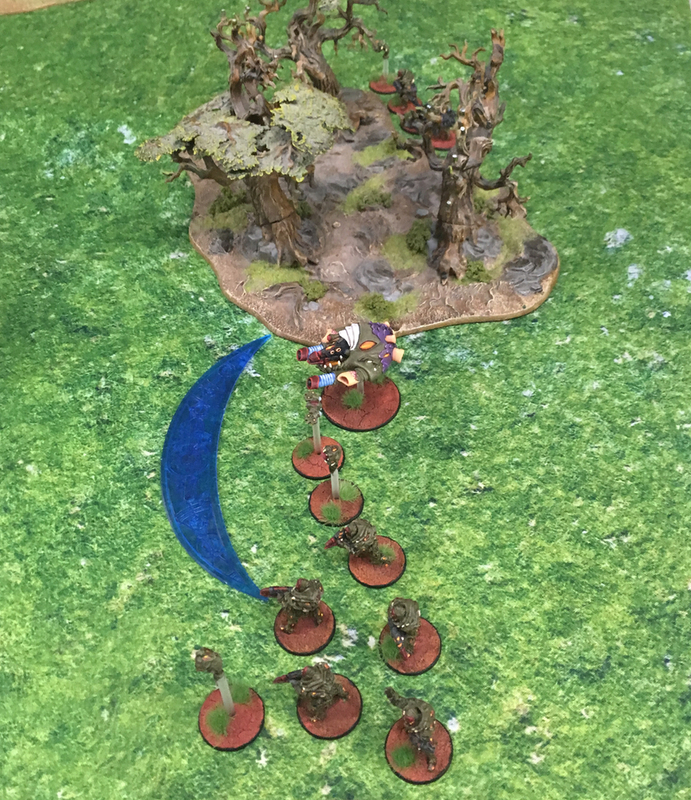 It was certainly a fun game even with my Tsan Ra Torus squad deciding to stop in front of the forest and eat flowers. Jeremy had his share of failed Command tests as well but since he wasn’t on a clock to take objectives they weren’t as punishing as mine were. 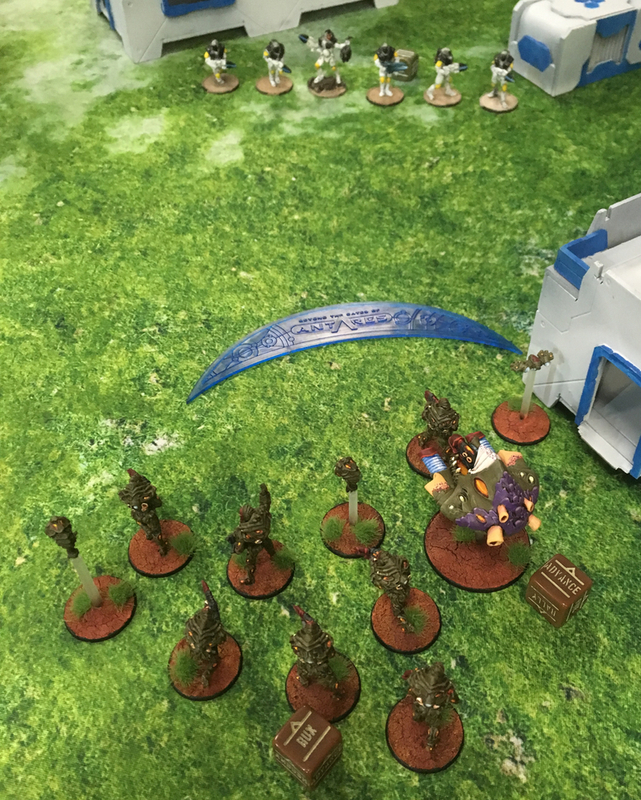 The Isorians were a fun army to play. 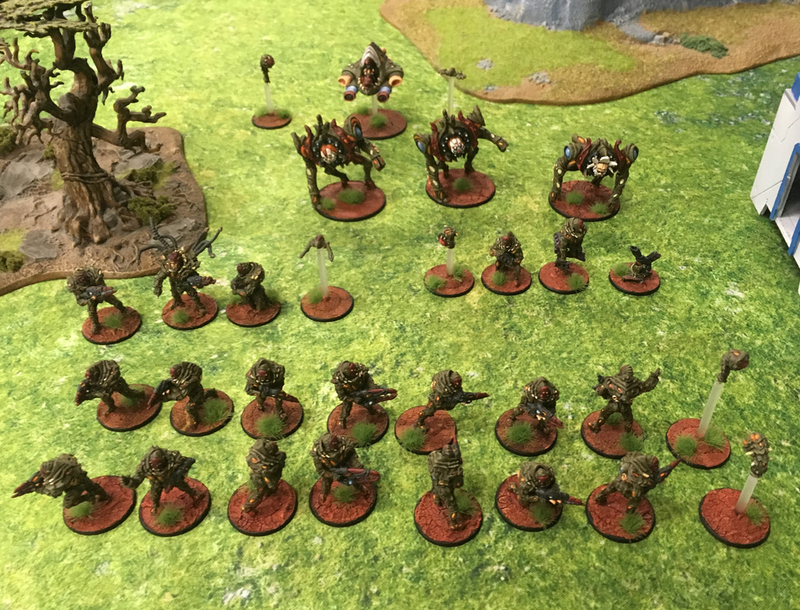 Knowing that I could use the Phaseshift Armour to put a unit down after it had activated changed how I activated my squads. And having an X Launcher was utterly awesome. Scramble rounds are absolutely amazing! I am going to be purchasing another X Launcher team just so I have the option of taking two in a larger game. At this point level and without a lot of the unique models for the Isorians it did feel as if it was a mirror match in some respects but it was still a lot of fun. The Batter drone was very useful and I am glad I have two painted already so I will have one to add to the transport when I get it done. Being able to cut down on Acc like that and also position it to guard against specific fire is very useful. 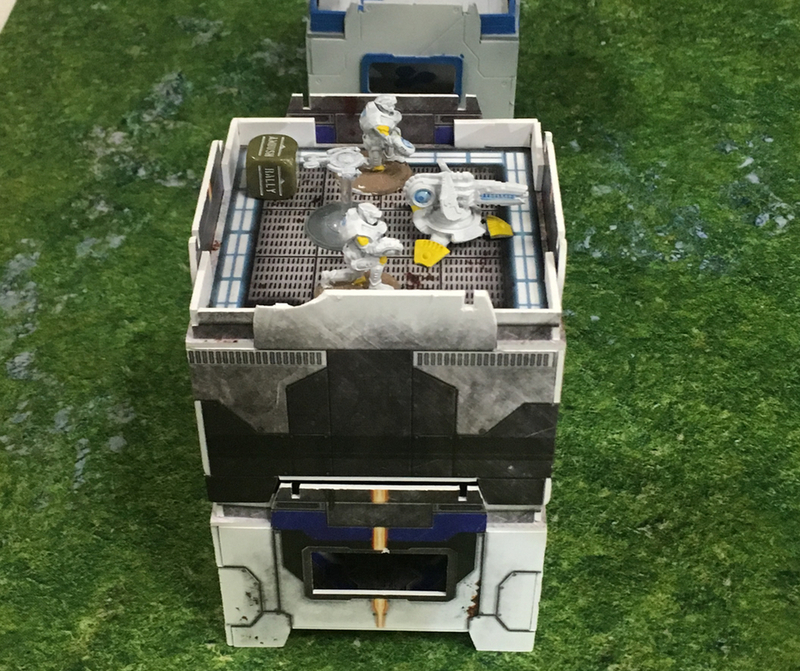 We are hoping to play again next week and I am hoping to have my Phase Sniper and Transport ready so I can use those. 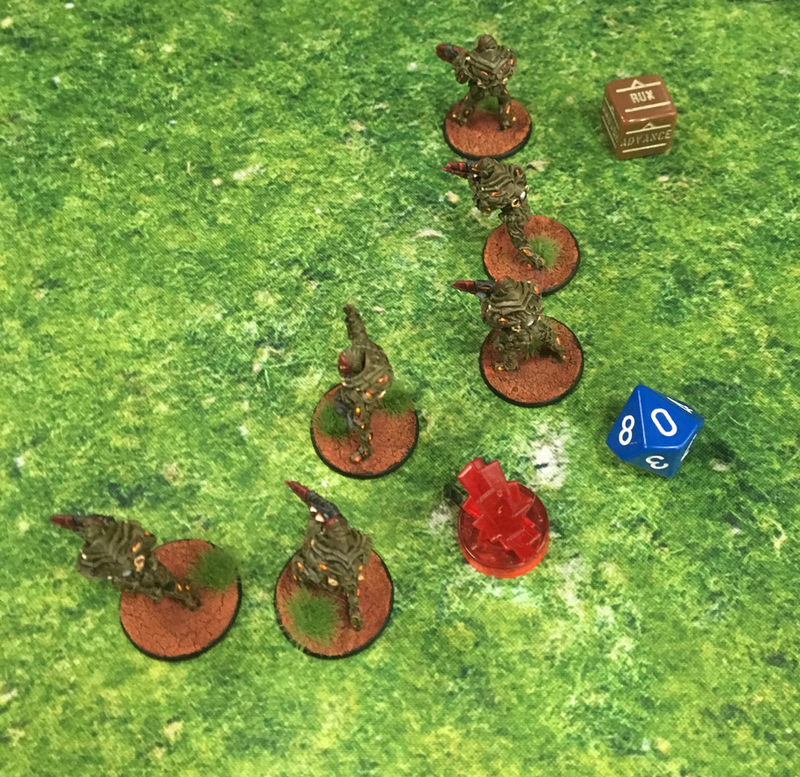 One thing that was new this game was a Bolt Action Order Dice bag that I picked up this week. It seems like a minor thing but prior to this we were used a red fabric dice bag for Order Dice and this just worked so much better. It stayed up and open on the table and it was wide enough to easily fit your hand in. I wouldn’t have thought it was a big deal but I loved it.